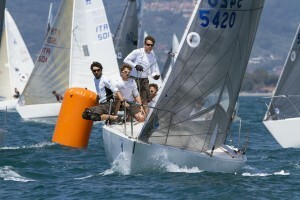 Team Rotoman (GER 5420), helmed by Tobias Feuerherdt, has opened the 2016 championship season with a double punch: After winning the windy and cold German Open in Glücksburg, the team also succeeded in the more gentle Mediterranean waters, were Rotoman won the Italian Championship in Carrara. During the Pentecost holiday, the German J/24 fleet gathered in Glücksburg for the German Open 2016. 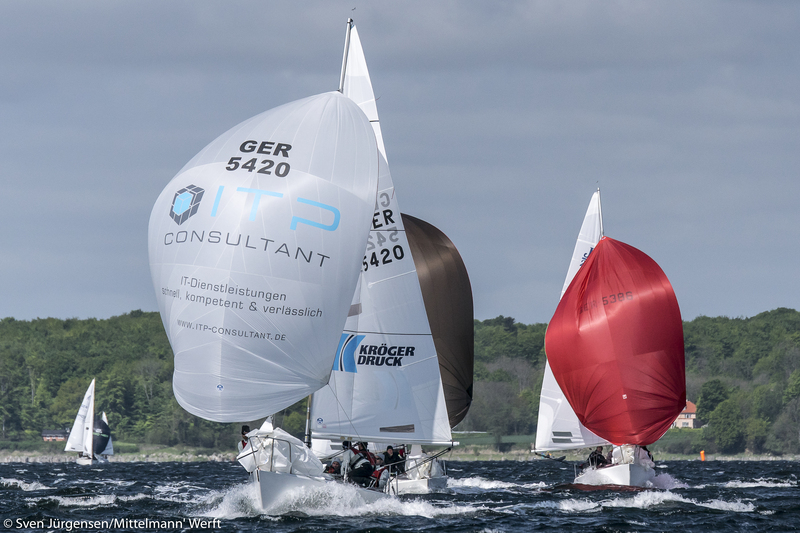 With temperatures about 10C, wind peaks of 30 knots and even some hail gusts, the Glücksburg waters neighbouring the Danish border proved very demanding for all competitors. The weather was light to start with on Saturday morning, then strengthened dramatically for the next two days. The Flensburger Segel-Club’s PRO, Claus Otto Hansen, managed to run four races on Saturday and two more on Sunday. On the final race day, the wind was blowing so hard that the Star and Dragon Classes, who were also competing, had to stay ashore and only the Melges 24s and J/24s were sent out. In average wind speed of about 20-25 knots, that final day saw some spectacular downwind flights and dramatic shifts on the leader board. In the last race of the day, the three leading boats JJOne, Süllberg and Rotoman literally changed position with every manoeuvre. Finally, Team Rotoman kept his cool and won with only one point ahead of JJOne helmed by Daniel Frost. Team Süllberg with Stefan Karsunke at the helm entered the podium as third. Team Tinto, who finished the Worlds 2015 as the best German team, finished in the eighth position. The top women’s team was Juelssand (GER 5313) with helmswoman Ann-Kathrin Frank in ninth position. Besides the chilly conditions, all teams enjoyed the venue and the great hospitality of Flensburger Segel-Club who provided excellent, fair and safe racing conditions throughout the event. See the final results here: http://www.j24.de/Ergebnisse/Ergebnisse_2016/Pfingst_Cup__J24_German_Open_688.html. The victory in the very north of Germany proved to be a source of motivation for Team Rotoman, who three weeks later headed to Marina di Carrara in the Tyrrhenian Sea for the Italian Nationals. In a fleet of 36 competitors, the crew from river Elbe during eight races established a lead of 14 points on second-placed Keith Whittemore (USA). Third overall and first Italian team was Francesco Bertone with his team Kong Grifone. 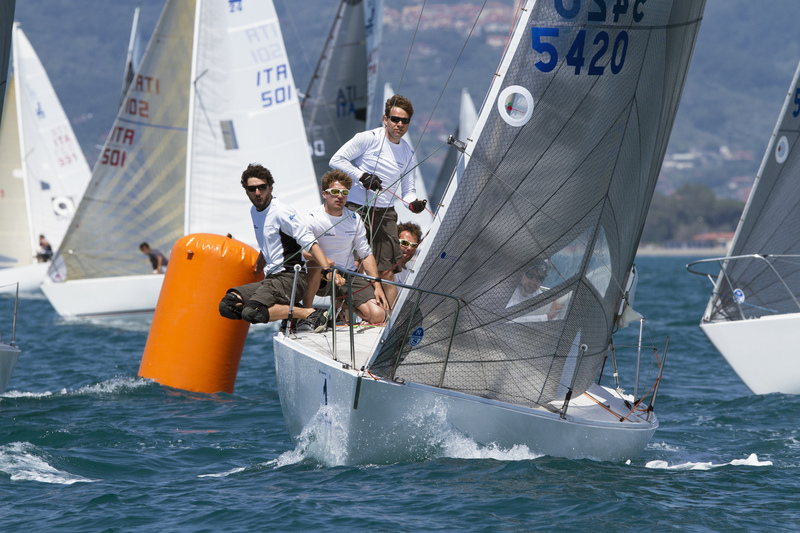 See the final results here: http://www.j24.de/Ergebnisse/Ergebnisse_2016/J24_Italian_Nationals_689.html.